HTML5/XML to PDF Converter - styled with CSS! What is Oxygen PDF Chemistry? PDF Chemistry allows you to obtain PDF output from HTML or XML documents simply by styling them with CSS. It is a CSS Paged Media processor based on the open-source Apache FOP XSL-FO engine. Its main purpose is to provide you with a simple tool that allows you to leverage your CSS knowledge to create printable deliverables. It is particularly useful for generating technical documentation. Control all aspects of the styling in your output. Avoid or force page breaks for specific content, automatic hyphenation, customize page headers, footers, footnotes, columns, tables, lists, graphics, element positioning, cross references, create a table of contents, provide bookmarks, align blocks, and much more. 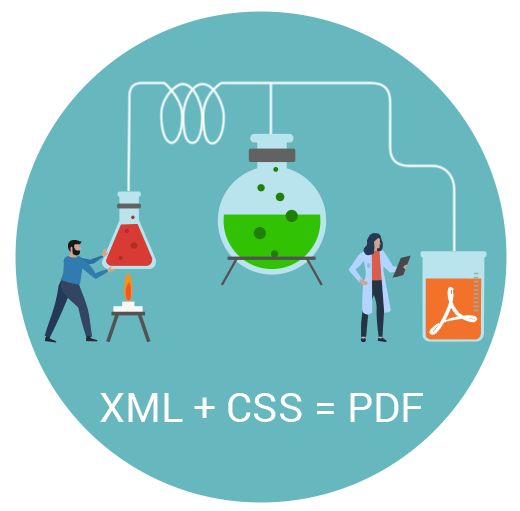 Perfect for those who are familiar with CSS, PDF Chemistry makes it very easy to style, customize, and test your PDF output without having to work with complicated xsl:fo customizations. It can be used from a command line or selected as a processor for PDF transformation scenarios within Oxygen XML Editor/Author. In addition to common TrueType fonts, PDF Chemistry supports web fonts, Google fonts, automatically embedded fonts, and a combination of font families to cover large character ranges, including Arabic, Hebrew, and Asian languages. You can also use fallback fonts to provide rendering coverage across all devices. PDF Chemistry adheres to government accessibility requirements (508 compliance), helping you to make your PDF output accessible to end users who are blind or visually impaired. Create CSS capable of rendering multi-lingual content. PDF Chemistry provides support for right to left (RTL) text, ligatures, and changing static text depending on the language. Improve Web content using PDF Chemistry to publish XML or HTML5 documents. It supports raster images (JPEG, PNG, GIF, etc. ), vector images (SVG, MathML, PDF, etc. ), and CSS3 syntax.